Everyone should take pride in their roast potato preparation. The enjoyment of eating a well turned-out roast potato is similar to the feeling of waking up early on a Saturday morning and realising you don’t have to get up for work. Pure satisfaction. Roasting up a bunch of potatoes – how hard can it be, I hear you ask? Well, I’ve eaten too many a soft and soggy spud while eating roast dinners out, and it’s such an avoidable disappointment. Crispy on the outside and fluffy on the inside is the pièce de résistance and is achievable with this recipe. 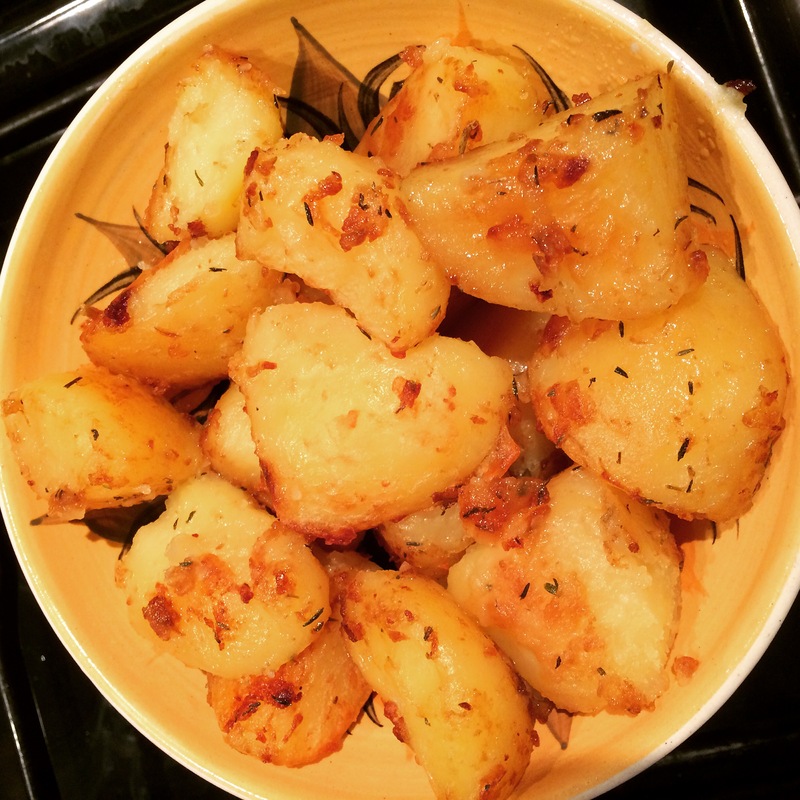 A hint of marmite helps to crisp the potatoes up well and adds a lovely depth to their flavour. And a touch of thyme brings a sprinkling of richness to the equation. 1. Half-fill a medium-sized pan with cold water. Add a pinch of salt, place it on the hob and bring to the boil. 2. Meanwhile, peel the potatoes and rinse under a cold tap. Cut in half, and then cut each half into quarters. When the water begins to bubble, gently lower the potatoes into the water. Boil gently for 10-15 minutes. 3. Put the oven on to gas mark 6. Pour the oil into a medium-sized baking dish and sprinkle over the thyme. Place in the oven to warm through while the potatoes are cooking. 4. Test to see if the potatoes are ready by poking a knife through a couple of slices and making sure they’re fairly soft (but not too soft!) If they’re ready, drain them in a colander and press them gently with the back of a spoon to remove excess moisture. Put them to one side. 5. Take the baking dish out of the oven and carefully tip the potatoes into the dish, evenly distributing them throughout. Add the marmite to the oil so it melts and is easy to distribute over the potatoes. Coat all of the potatoes well in the oil, making sure you get a touch of marmite on all of the slices. Pour over a touch more oil if necessary. 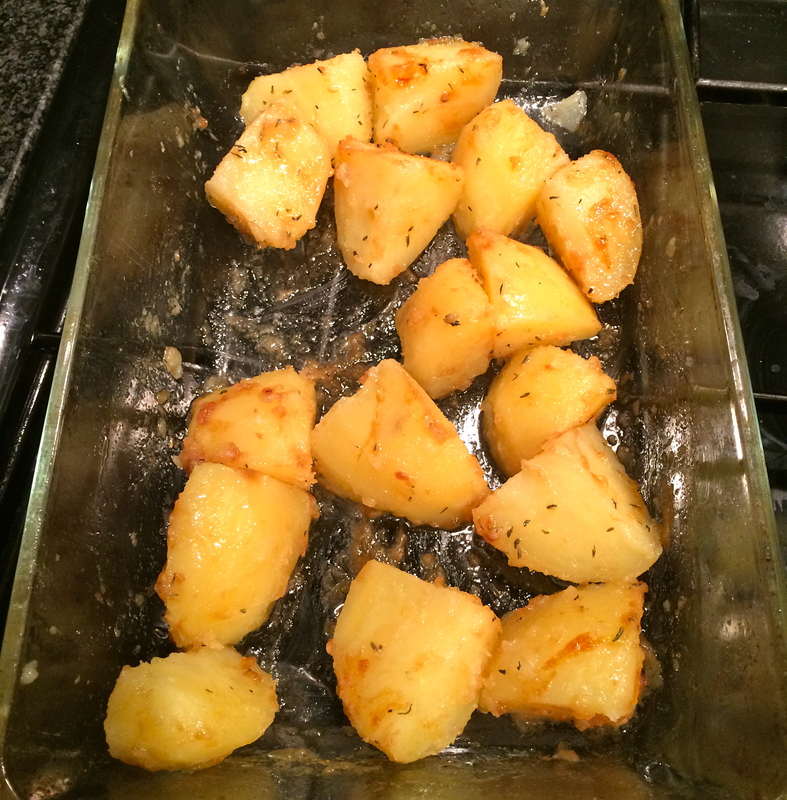 Potatoes covered in marmite, thyme and oil – ready for the oven. 6. Place in the oven for 45 minutes. Check on them every 15 minutes or so and turn them over to make sure they crisp up on all sides. After 45 minutes, they should be looking golden and crispy, which means they are ready to serve. Season well with salt and pepper and serve as a delicious accompaniment to a roast dinner.